We require scheduled appointments. If you are unable to make your scheduled appointment, please contact us at least 24 hours prior to your appointment. 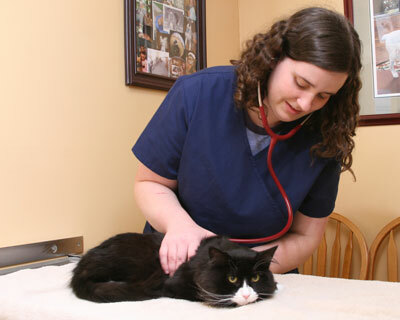 We offer a drop-off service allowing your pet to stay with us for the day at no extra charge to you, and be given its bi-annual exam, vaccines, medical diagnosis and treatment. Please do not allow your pet to have food or water after midnight, the night before surgery. You will be scheduled a surgery drop-off appointment between 8:00am and 8:30am on the day of your pet's surgery. A vet assistant will review your pet's pre-surgical information and address any concerns you may have before your pet's surgery. Please allow at least 15 minutes for your surgery drop-off appointment. Payment is expected when services are rendered. We accept Cash, Visa, MasterCard, American Express, Discover, and CareCredit.